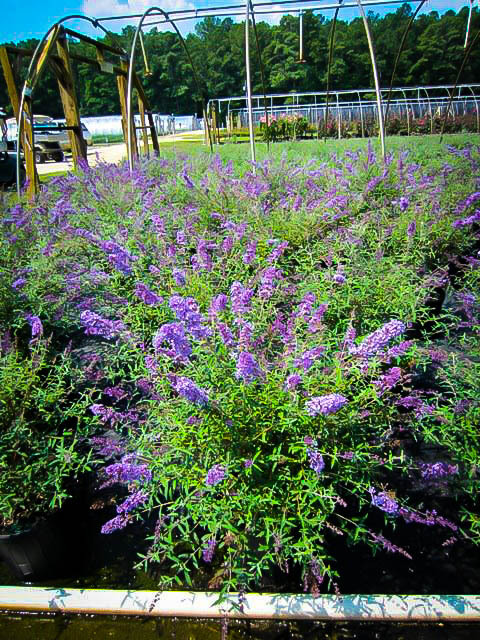 The Nanho Blue Butterfly Bush is a wonderful shrub for all those hot, drier spots in your garden. The grey-green foliage and large, 8 to 10-inch-long clusters of blue flowers look wonderful in the sun, and those blossoms come continuously from June to the first frost. 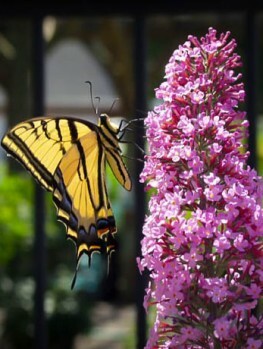 Not only are they sweetly scented, like honey, they attract many different types of butterflies. 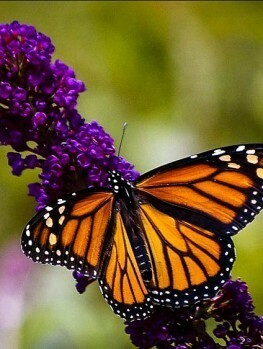 Your children or grandchildren will love to watch them come and go, feeding on the nectar. 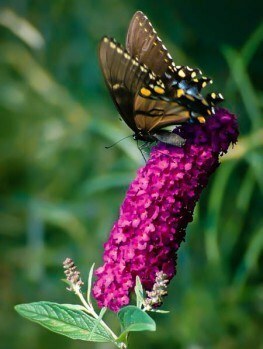 This easy-to-grow plant is only 3 to 5 feet tall, unlike other much bigger old-fashioned kinds of butterfly bushes, so it fits perfectly into smaller gardens or smaller spaces. Plant it below a window, where you can see and smell it from inside. Plant it against lattice or along a picket fence, for that perfect cottage garden look. You will not believe how many flowers it produces, for so little input from you. 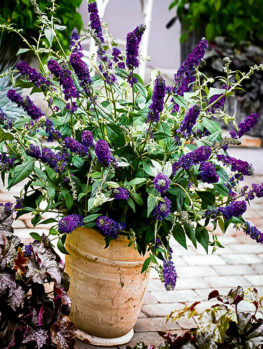 The Nanho Blue Butterfly Bush will grow in any well-drained soil, in a sunny spot. Once established it is drought-resistant, and it thrives in the heat. It has no significant pests or diseases, and rabbits leave it alone too. The only care is an annual cutting back in spring and removing flower clusters as they fade – it only takes a quick snip, and your plant will reward you with more, and bigger, flower spikes. A little fertilizer in spring will help it grow more vigorously, but this really is a shrub you can plant and forget, even in poor soil, urban conditions, and out in the heat and sun. Large conical flower clusters in a delicious shade of mauve blue; a sweet perfume that fills the air; flowers all summer long, and into fall; very easy to grow with minimal care; a magnet for beautiful butterflies – what’s not to like? 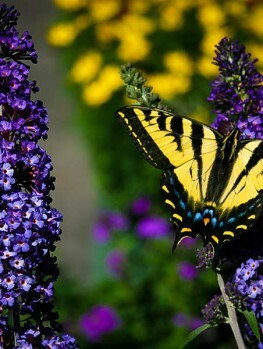 The Nanho Blue Butterfly Bush is a classic selection of this always-popular shrub, a plant that always attracts young children, or is it the butterflies that do the attracting? 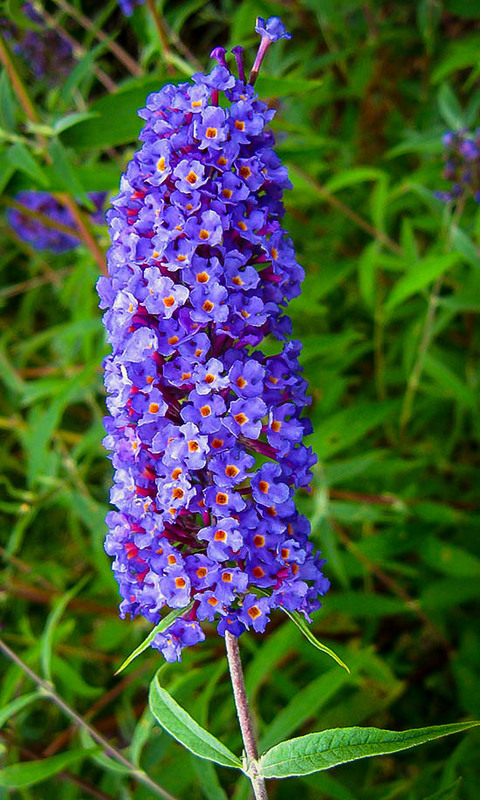 Whichever it is, the Nanho Blue Butterfly Bush is a fantastic addition to any garden. If you have hot, sunny places, with soil that tends to become dry, then this is a plant that will thrive for you with no effort at all. Why plant something that will be constantly wilting and feeling sorry for itself, when you can grow a robust, vigorous plant that is constantly in bloom? 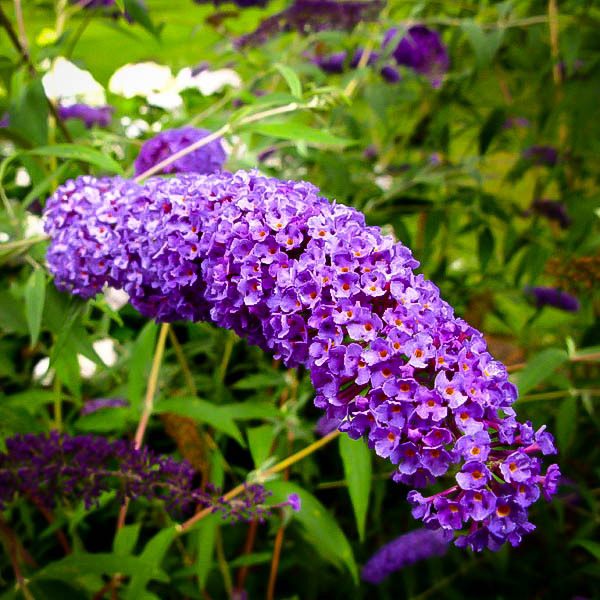 Unlike some of the newer forms of the Butterfly Bush, which have small flower clusters, this one has full-sized heads 8 to 10 inches long, packed with flowers, and arching over in a graceful way from the stems. Unlike some very old, wilder butterfly bushes, which can grow 10 to 15 feet tall, the Nanho Blue Butterfly Bush grows a perfect 3 to 5 feet, fitting well into small to medium-sized spaces, and bringing tons of color – and that delicious honeyed perfume too – so summery and evocative of hot, lazy days. Plant this shrub – which has an open, arching form – among denser shrubs, or by a door or below a window, where the perfume will drift into the house. It looks terrific beside a picket fence, or against lattice, and it can even be tied back to keep it flat and wide, taking up almost no space. Plant it where your children or grandchildren can easily reach it, so they can smell the flowers and see the beautiful butterflies and other insects it attracts. They will love it! 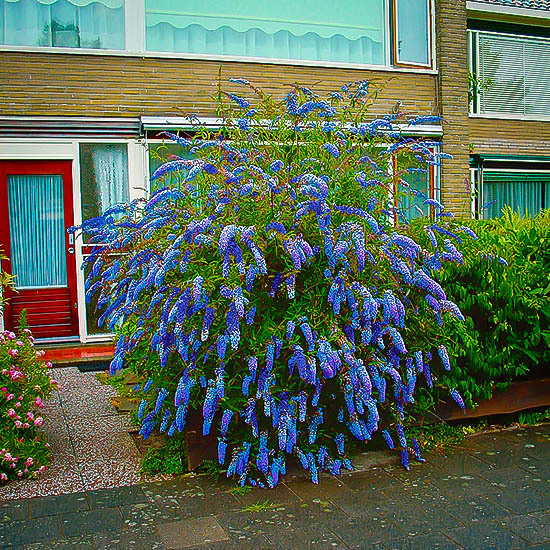 The Nanho Blue Butterfly Bush forms a shrubby, multi-stem plant, typically 3 to 5 feet tall, and the same across. It has upright, arching stems, with narrow leaves, about 4 inches long and one inch wide. They are grey-green, and slightly felted. In fall they turn deep silver-grey, and the stems turn bronzy, before the leaves fall for the winter. From June to September, and right up to the first frost, this plant is constantly producing new flower spikes, so it is never out of flower. The spikes are up to 10 inches long, and they are made up of many tiny flowers, in shades of blue to mauve, depending on the air temperatures – bluer in cooler weather, more mauve in the hottest days. 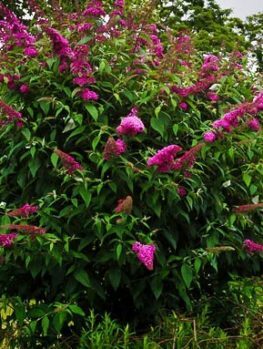 Plant the Nanho Bue Butterfly Bush in a sunny spot, in any well-drained soil. It grows well in hot, dry places, once established, but remember to water it regularly during the first season, so that it builds a strong, drought-resistant root system. It has no significant pest or diseases, and it is not eaten by rabbits. The only care needed for this easy-to-grow shrub is some pruning. In early spring, just as the new growth appears, remove any dead or weak stems, leaving just a few of the strongest branches. Cut these back to about 12 inches above the ground, just above a pair of strong sprouting buds. In colder winters sometimes all the branches die down to the ground. This is normal, and your plant will re-sprout vigorously from the base, and soon be back again in bloom. As well, remove flower spikes as they fade. Cut just above the first pair of leaves. This will keep your plant blooming vigorously and continuously, as well as preventing it from seeding. In some parts of the country this plant has escaped and interfered with the growth of native plants. You can easily prevent this happening just be removing spent flowers so that no seed is produced. It’s easy, and you also get many more flowers, and larger spikes too. The Nanho Blue Butterfly Bush was bred from a Chinese butterfly bush called Buddleja davidii. This is a large shrub that grows in rocky places. In the north west of China there is a province called Kansu, and there a unique variety of Buddleja grows, called variety nanhoensis. This plant is smaller, with narrower leaves. It was brought to Europe by the plant collector Reginald Farrer in 1914. 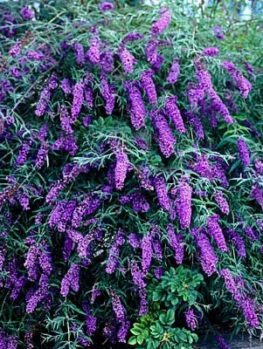 In the 1980s Monrovia Nursery, in California, used this plant to produce a range of butterfly bushes, of smaller size but still with big flower spikes, called Nanho hybrids. There are several colors, and one, Nanho Blue, officially called ‘Mongo’, stands out for its terrific color. It was developed in 1984, and it received the prestigious Award of Merit from the Royal Horticultural Society in 2002. It is also sometimes called Nanho Petite Plum, Nanho Petite Purple, or Nanho Petite Indigo. Our plants are grown by rooting stem pieces taking from correctly named plants. They are not grown from seed, because cheaper seedlings develop into plants of unpredictable colors and sizes, not the carefully selected Nanho Blue form. 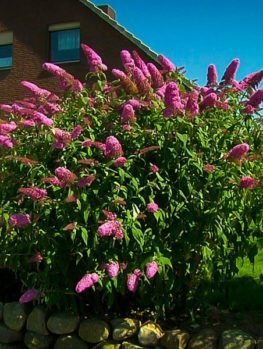 Butterfly bushes are always popular, and this is one of our biggest sellers, so order now while we still have stock available.